Some of you who follow me on Twitter may know that for the past 6.5 days I’ve been on a raw cold pressed juice cleanse. I’ve blogged about juice cleanses before (check it out!) and almost everyone I encounter when I’m on one of these cleanses has tons of questions. Nutrients in every color of the rainbow! What: A juice cleanse consists of consuming only raw cold pressed juices, meaning that the juices are not pasteurized – therefore, the juices still contain all vitamins, minerals, and enzymes. Why: Drinking raw cold pressed juice is one of the quickest and easiest ways to flood one’s body with nutrients. Did you know that your cells actually absorb the nutrients in juice as quickly as alcohol enters the bloodstream? Normally when consuming solid foods, nutrients are not absorbed until after the body goes through the lengthy digestion process. 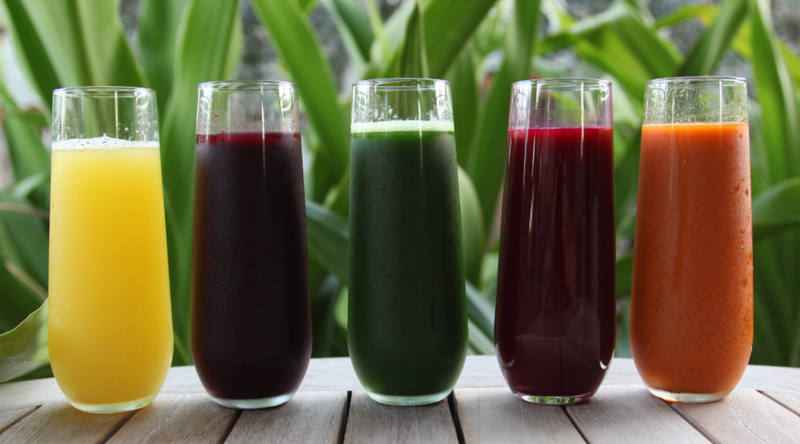 Juice cleanses also help detoxify and reboot your system. Be aware that you may feel nauseated or have headaches and other detox symptoms on the first couple days of your cleanse. I usually do about 4 of these cleanses a year, but up until this point, the longest I had ever done was 3 days. My good friend Marcia – who is a warrior and at one time has done a 10 day cleanse, convinced me after eating many veggie corn dogs and drinking several bourbon drinks over the course of a weekend at a music festival in Kentucky that we should do a 7 day cleanse. I reluctantly agreed, totally questioning my ability to give up solid food for an entire week. Somehow, I’ve managed to get through the past 6.5 days with no solid food, coffee, or alcohol. And I didn’t even kill anyone!!!! As long as we’re talking about this, I might as well get real – were there a lot of times where it was hard? Yes. Is eating solid food one of my greatest joys and passions? YASSSS. Was it an exercise in discipline, willpower, and sticking to a commitment? Absolutely. Am I so proud of myself for committing and proving to myself that I could do it? YEAH. Like I said, I didn’t even know if I was capable, but after the first few days, cleansing starts to feel incredible and it does get easier. Let just TELL you, I am feeling healthy, hydrated, well rested, energetic, and on cloud 9 – and in addition, completing something that was such a challenge has made me feel like I can do anything. How: I have a juicer at home that I use a lot, but am so thankful that I live in a city that is so on board with healthy eating. I wanted to shout out some of my favorite spots to get juices and healthy smoothies here in Nashville. Check them out if you haven’t already! This entry was posted in Food, Health and Beauty and tagged Brenna Mader, Center of Symmetry, Fit Food Revolution, juice cleanse, juice Nashville, Juice Place, Nashville, raw, The Urban Juicer, vegan, Whole Foods on July 31, 2014 by Brenna. Today’s dressed up casual look combines some classic summer pieces: linen, denim shorts, and aviator sunglasses. J Crew makes some of my favorite button ups of all time and I have tons of GAP denim. These GAP 1969 Maddie Denim shorts have been my go-to all summer. They have a little bit of stretch and are so comfortable, plus I’m obsessed with the color of the denim. They’re on sale now, so get them before they’re gone! I also love the way rose gold looks with this color palate and my Count Me Healthy by Chelsea Charles bracelet and earrings were the perfect classic accessories to complete the rest of my outfit. All photos by Kara McLeland shot in Franklin, Tennessee. This entry was posted in Style and tagged #WhatIWore, Brenna Mader, Coach Aviators, Cole Haan Wristlet, Count Me Healthy By Chelsea Charles, Essie tart deco, GAP 1969 Denim Shorts, gap classic belt, J Crew Perfect Linen Shirt, Michael Kors Watch, Miranda by Miranda Lambert Escapade, OOTD, rain cosmetics private jet, Rose Gold, Wanderlust and Glitter Dust on July 25, 2014 by Brenna. Lately I’ve caught some flack from some of my guy friends about not posting about men’s fashion so today is the day! I spent some time compiling some of my current favorite looks for men. I tend to gravitate to very tailored classic looks for men in both casual wear and suits. That brings me to my next point – I love a guy in a suit, but guys, take note – make sure it is tailored to you, that makes all the difference. There is also a blonde ASOS model who appears on this post MULTIPLE times that I am apparently crushing on… but that’s beside the point… Look for more men’s fashion posts coming to Wanderlust and Glitter Dust, I have some fun ideas in the works! Hover your mouse over an image to see the price and brand, happy shopping! This entry was posted in Style on July 22, 2014 by Brenna. This entry was posted in Style and tagged Ankle strap heel, black and white, Brenna Mader, Calvin Klein Vivian, Calvin Klein Vivian Black and White Lizard, Crop Top, Crop top and blazer, Fashion, Fashion Friday, high waisted shorts, House of Harlow Sunburst Ring, Kara McLeland, OOTD, white blazer, White House of Harlow Sunburst Ring on July 18, 2014 by Brenna. One of my favorite makeup looks is a cat eye. I love all of them all – from a subtle retro look to a dramatic smokey eye. I’m a longtime devotee of gel eyeliner, but recently I got my hands on a new limited edition product from MAC Cosmetics call the Kelly Jumbo Penultimate. It’s from the collaboration MAC did with Sharon and Kelly Osborne and it’s essentially a sharpie for your eyes. The penultimate has a tip just like a marker that allows you to create the most thin and natural lines as well creating as much intensity as you want. Using the marker allows for much more precision than a brush in my opinion – so for those of you who haven’t mastered the cat eye yet or who want to make it much easier, get your hands on the Kelly Jumbo Penultimate before it’s gone forever! I would love to see pics of the cat eye looks you all create – and I’ll even share some of them! Leave me a comment here or share them on Twitter or Instagram! I’ll leave you with Forte Femme’s latest video – their own arrangement of Kimbra’s “Settle Down.” If you like upbeat, current, acapella music, you’ll LOVE Forte Femme! This entry was posted in Health and Beauty and tagged Brenna Mader, cat eye, easy cat eye, Forte Femme, how to create a cat eye, Kara McLeland, Kelly Jumbo Penultimate, MAC Cosmetics, product of the week, product review on July 17, 2014 by Brenna.